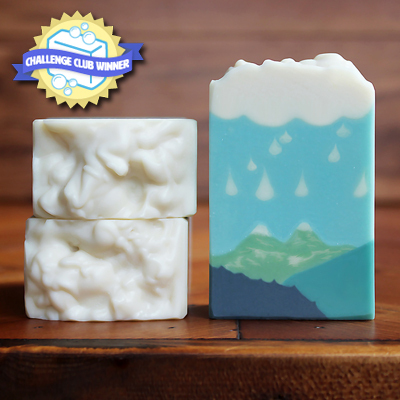 The soap is made with local rain water and is scented with a blend of essential oils with a forest-type aroma. Click on the photo to see the post and video about her soap on Instagram. Belinda wins a $50 gift certificate from Nature’s Garden, and as an international winner, the Challenge Club will subsidize part of the shipping expenses for her prize! Sara went to great lengths to make sure the soap didn’t set up too fast and that each layer above didn’t break through into the one beneath it. Click on the photo to see her post on Facebook with more photos of her process. Congratulations, Sara! She wins a $35 gift certificate from Nature’s Garden. Teri wins a $25 gift certificate from Nature’s Garden – congratulations! Click on the photo to see her post on Facebook for more information and to see all the other soaps she made. Click on the photo to read more about how she made her soap on Instagram! 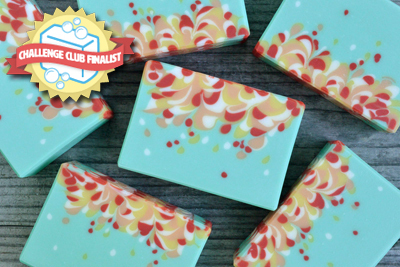 The next award for Best Use of Color goes to Linda Whitcomb of Island Springs Soapworks in Washington state. 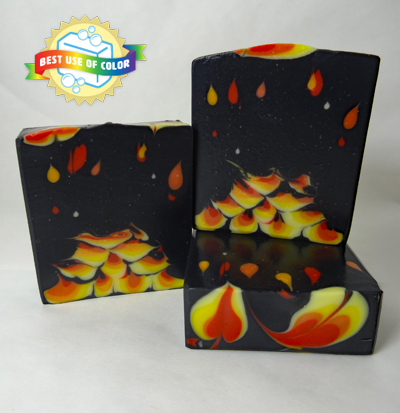 Linda’s En Fuego soap has intense colors that perfectly showcase a fiery display. The colorants are evenly dispersed within the soap and the intensity is sharp without being oversaturated. Linda’s Instagram post is also linked to the photo of her soap. For Best Presentation, I’ve chosen Berries & Spice by Ruth Potter of PotterMadeSoap in Arizona. Ruth’s soap is displayed in such a way that you can see the beautiful colors and drops in each bar. 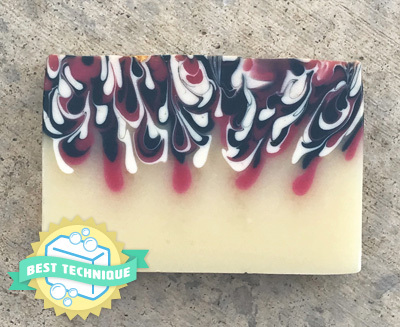 The angle of the photo gives interest and the soap has excellent contrast so it stands out against the background. The bars are all shaped and cleaned and lined up perfectly. Be sure to check out her Instagram post by clicking on the photo. I’ve also taken the liberty of creating a Best Newbie Award! 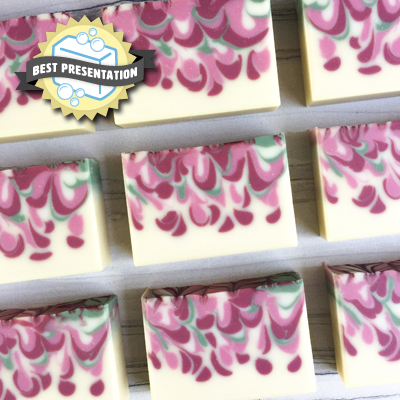 This award is for outstanding soapmakers who have only been making soap for less than a year and have made fewer than 50 batches in their soapy career. In the advanced category, I have chosen Ania Rynarzewska of Lux Leonis Skincare in Georgia for her Weeping Ocean soap. 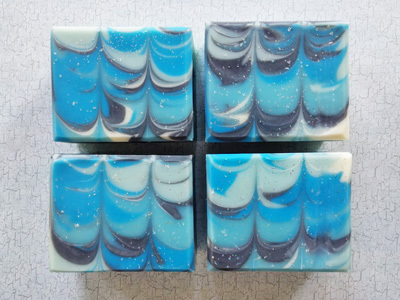 Ania’s soap shows excellent drops that are fully suspended in the soap – including one that is fully outlined – as well as a beautiful color scheme for her oceanic theme. 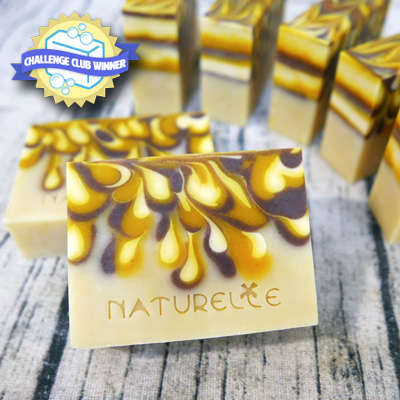 Her soap is not only a beautiful display of this month’s technique, but she has passionately spoken about her inspiration: water pollution. Please click on the photo for more information about this soap and Ania’s passion on her Instagram post. 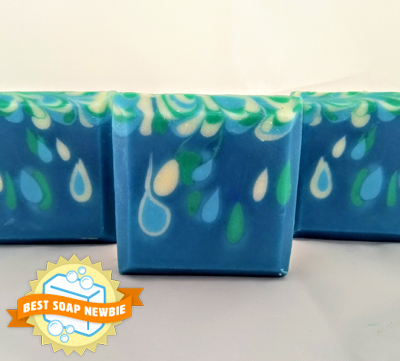 The appeal of this soap comes from the gorgeous way the soap drops are formed and the drops within drops! Yvonne has done a fantastic job of sharing her process with a video on YouTube. Click on the photo to check it out! She also wins a $50 gift certificate from Nature’s Garden with subsidized shipping for her prize. Congratulations, Yvonne! Click on the photo to read more about Debi’s process as well as her first attempt at this technique which she has comically written about! Debi’s prize is a $35 gift certificate from Nature’s Garden. Marty has photos of all her attempts at this technique on her Pinterest Board, so click on the photo to check them out! Her prize is a $25 gift certificate from Nature’s Garden. Congratulations! 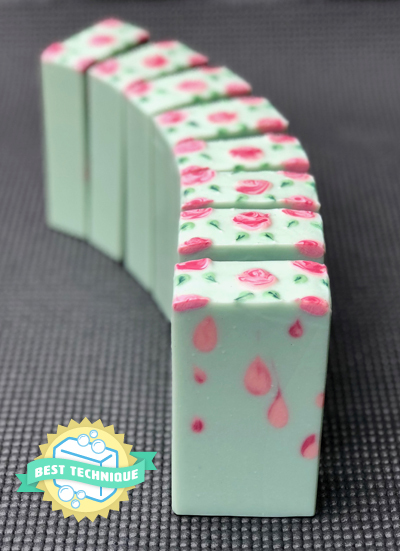 Best Technique goes to Lynette Olsen of Amazing Soap Company in California for her Apple Berry soap. I could tell the batter was quite fluid to create such lovely and delicate drops in the soap. It’s also a very controlled pour and excellent contrasting colors that have been alternated beautifully for a lovely pattern throughout. This is her entry photo, but you really need to check out the full album she compiled on Instagram – go ahead and click on the photo! 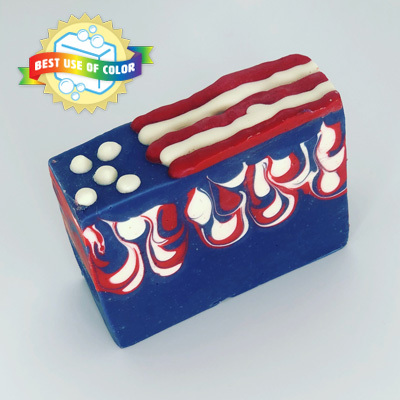 For Best Use of Color I’ve chosen Star Spangled Soap by Sarah Shafer of Gooseberry Soaps in Missouri. The flag colors were a necessity to pull off the effect, and the intensity of the blue and red is spot on, while maintaining a bright white without the red bleeding into it. Photo is linked to her Instagram post! 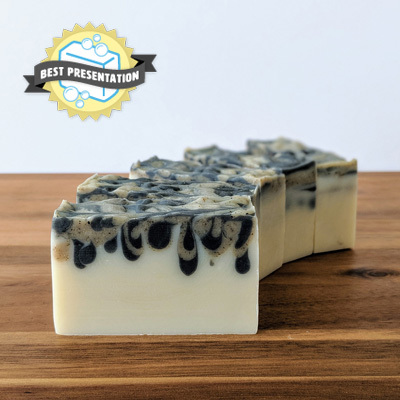 For Best Presentation, I’ve chosen Judet Diaz in Nevada for her Rosemary Charcoal Mini Drop Swirl soap. 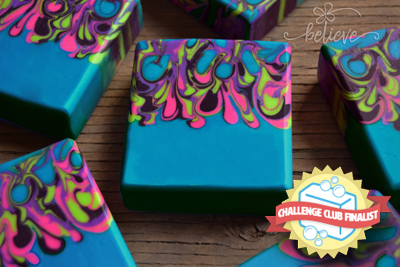 It’s hard to believe she hadn’t made soap for a YEAR when she decided to join the Club and make this soap. This photo is gorgeous for a lot of reasons: 1. The soap is the main attraction of the photo. 2. The soaps are arranged beautifully. 3. The photo is sharply focused in the front with a slight fade to the back. 4. 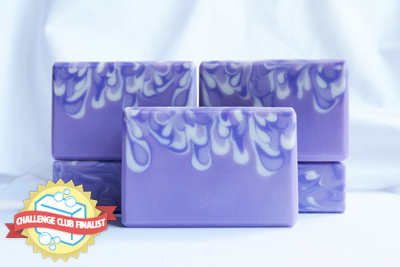 The neutral background enhances the soap and draws the eye to the front soap in the photo. This gorgeous photo is linked to Judet’s Instagram post. Last, but certainly not least is the Best Newbie Award for the regular category. 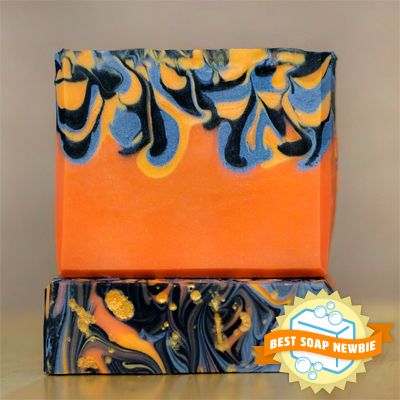 This award goes to Lydia Truitt of Herbal Valley Farm in Maryland for her Peach Ring of Fire soap. I appreciated Lydia’s documentation and story that went along with her entry as she told about her journey to create a campfire soap. She was tenacious in her efforts and they definitely paid off! The resulting soap is both beautiful and well-made as the soap batter was obviously fluid throughout the entire pour. She did an excellent job of beveling the edges and presenting it for her entry photo. 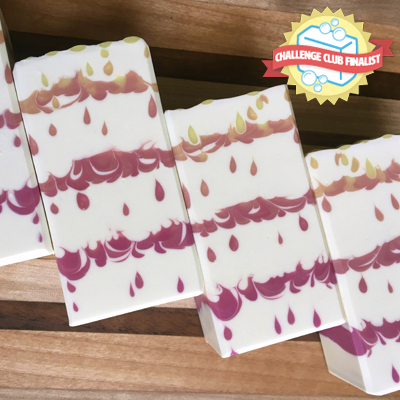 Click on the photo to see all three batches Lydia made for the challenge and how she improved with each one! If you would like to see the results of the votes and the rest of the entries, the regular category is HERE and the advanced category is HERE. Bramble Berry is our sponsor for October. Registration will be open Monday, October 1st – Monday October 8th only! (You also have the option to sign up for November and December at a discount.) Check out the Current Challenge page for all the details!